Houghton Mifflin Harcourt (HMH) is introducing globetrotting super-thief Carmen Sandiego to a new generation, beginning with the launch of a new animated series debuting Jan. 18 on Netflix and produced by HMH. To celebrate Carmen's return, HMH partnered with Miami-Dade County Public Schools this week to bring nearly 2,000 students together for a live event with superstar Gina Rodriguez, the new voice of Carmen. Netflix Animated Series: On Jan. 18, the new Carmen Sandiego series, starring Gina Rodriguez (Jane the Virgin) as Carmen and Finn Wolfhard (Stranger Things) as her tech-whiz sidekick, Player, will bring viewers inside Carmen's world, revealing for the first time her identity as a modern day Robin Hood traveling the globe and stealing from V.I.L.E. and giving back to its victims. 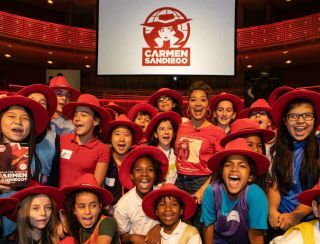 Book Series: HMH's Carmen Sandiego 2019 publishing program will kick off with Who in the World Is Carmen Sandiego? on Jan. 22. Available in both Spanish and English and featuring a foreword by Gina Rodriguez, this novelization based on the Netflix series uncovers the story behind the enigmatic thief. Carmen in the Classroom: This week's announcement signifies Carmen's return to schools, including resources such as lesson plans mapped to Carmen episodes, Google Earth and Google Expeditions games, original digital content and Carmen-themed instructional videos designed for classroom settings, a school-focused Carmen Sandiego webpage with free resources, downloadable activities and more.